Greetings from The 88 Project! We are bringing you news, analysis, and actions regarding human rights and civil society in Vietnam during the week of April 9-15. This week, Brotherhood for Democracy members Nguyen Van Tuc, Tran Thi Xuan, and Vu Van Hung were sentenced to 13, nine, and one years in prison, respectively, for their peaceful activism. Vietnam Republican Party founder, Nguyen Viet Dung, was sentenced to seven years in prison. Another Brotherhood for Democracy member, Nguyen Trung Truc, is still waiting to meet with his lawyer eight months after being detained. International advocacy organizations and the UN have condemned the recent trials and sentences of activists in Vietnam. A group of civil society organizations has openly expressed concerns over Asia’s restrictive internet laws, and in the news, read about activists’ specific concerns that Facebook is censoring their views in Vietnam. Read also about the potential implications of the crackdown on dissent on Vietnam’s economic growth and the lack of US attention to human rights violations in Vietnam. In case you missed it, six activists were sentenced to between 7 and 15 years in prison last week, including human rights lawyer and Brotherhood for Democracy founder, Nguyen Van Dai. Additionally, citizen journalist Do Cong Duong was arrested in January 2018, and his lawyer reports that he is in poor health. Please take action for the activists sentenced this week and last by writing to the Vietnamese government to demand the prisoners’ immediate release. The 88 Project is looking for Volunteer Vietnamese to English Translators/Editors and Board Members to work with us. Read more in the “Take Action” section below. Following the trial of Nguyen Van Dai and his five co-defendants last week, four more activists were sentenced to between one and 13 years in prison in Vietnam this week. On April 10, Brotherhood for Democracy member Nguyen Van Tuc was sentenced to 13 years under Article 79. Tuc, a former political prisoner, was arrested on September 1, 2017. He had previously served four years in prison under Article 88, from 2008 to 2012. On April 12, Brotherhood for Democracy members Tran Thi Xuan (top) and Vu Van Hung (middle) were sentenced to nine and one years in prison, respectively, while Vietnam Republic Party founder Nguyen Viet Dung (bottom) was sentenced to seven years in prison. Active in environmental and pro-democracy advocacy, Xuan was sentenced under Article 79 for subversion. She has been detained since October 2017, and since her trial was unannounced to the public – including her own family – beforehand; she had to face trial without her attorney. Vu, a former political prisoner and teacher, was sentenced for “deliberately causing injury” after being arrested in January. Nguyen Viet Dung, who was sentenced under Article 88 in a short, two-hour trial, previously served a year in prison after being arrested at an environmental protest. After the trials this past week, the number of activists sentenced in Vietnam in 2018 totals 26. Seven of them have received sentences of 10+ years. Meanwhile, detained activist Nguyen Trung Truc’s lawyer has submitted a petition to be able to meet with Truc to prepare his defense. Truc, the spokesperson for the Brotherhood for Democracy, has not been able to meet with his lawyer since being arrested in August 2017. Truc faces charges under Article 79, similar to other Brotherhood for Democracy members. Following the trial of human rights lawyer Nguyen Van Dai and five other activists, in which they received sentences ranging from 7 to 15 years in prison, and the trial of Nguyen Van Tuc mere days later, a group of UN experts released a statement questioning the Vietnamese government’s motives for jailing the activists, asking for clarifications regarding their detentions and trial, and urging the government to uphold international obligations to protect human rights and release political prisoners. 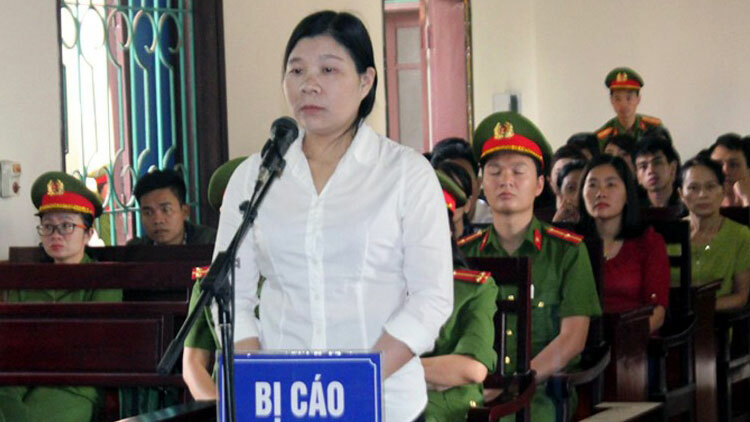 “We are deeply concerned at the way these peaceful campaigners have been treated and in particular over the use of Article 79 of the 1999 penal code of Viet Nam to charge and convict dissenting voices, mainly human rights defenders, especially as Article 79 carries the possibility of the death sentence or life imprisonment,” they said. On January 24, citizen journalist Do Cong Duong was arrested. Active in covering land rights issues, he also hosted “Tieng Dan TV,” which included live-streamed video discussions on Facebook. Duong was detained while he was filming a forced eviction in Tu Son commune, Bac Ninh province. He met with his lawyer, Ha Huy Son, for the first time on April 5, 2018. According to lawyer Ha Huy Son, Duong was charged with “disturbing public order” under Art. 318 of the 2015 Criminal Code, and he also shared that Duong was not in good health. Please share the cases of the four activists sentenced this week, and take action for Nguyen Van Dai and his five co-defendants, as well as Nguyen Trung Truc, Nguyen Van Tuc, and Tran Thi Xuan, with The Observatory for the Protection of Human Rights Defenders, a partnership of FIDH and the World Organisation Against Torture. Use their guide and contact information to write to the Vietnamese government to call for the immediate and unconditional release of the prisoners, the improved treatment of human rights defenders, and Vietnam’s compliance with international human rights agreements. Are you interested in human rights in Vietnam? Are you bilingual in Vietnamese and English? Do you want to get more involved in advocacy? Consider applying to be a Volunteer Vietnamese to English Translator/Editor or a Board Member with us. We are looking for dedicated and reliable individuals to help us advance our mission of supporting free expression in Vietnam. The positions are flexible and remote work is possible. Please click on the links in this paragraph to learn more and to apply.